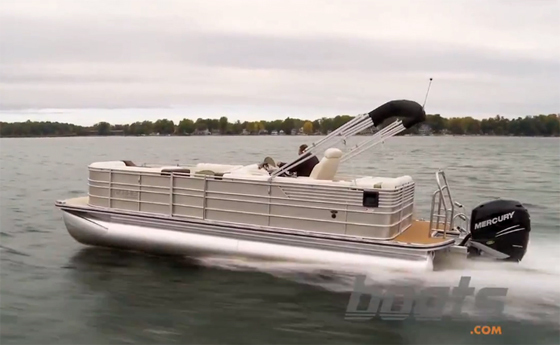 If you’re new to pontoon boats, you’ll want to know these tips. 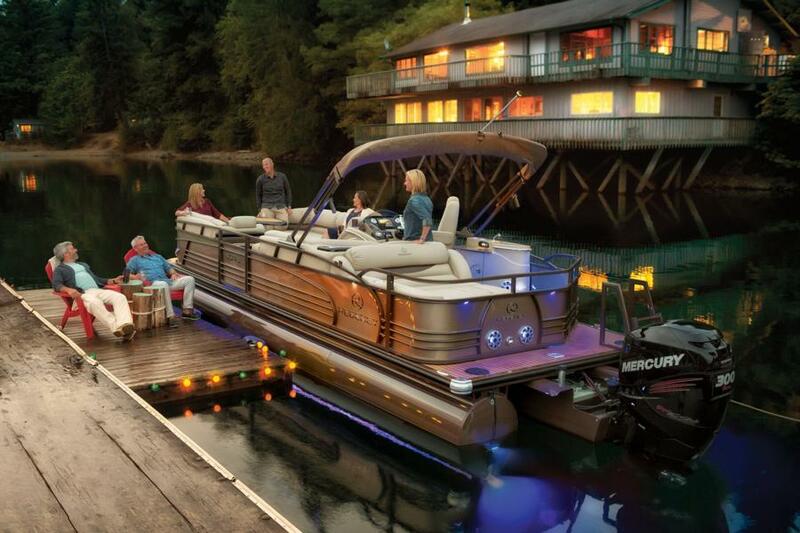 If you’ve read our Pontoon Boat Basics article, you know that pontoons come in all shapes and sizes these days. They sport more power than ever—one of those ten winners had 600 horses on the transom—and they may be designed for anything from plain old lounging, to watersports, to fishing. But no matter what sort of pontoon you’re interested in, all share a few quirks and characteristics that set them apart from traditional V-hull boats. Leave the dock being aware and in a controlled manner. Point the drive unit first, and then shift. Use a short applications of power, re-direct the drive, then use another. Repeat as necessary. Now in open water, make sure the engine is trimmed down to mitigate bowrise. Apply power smoothly and slowly. Watch for the bow to level out as the boat breaks onto plane. Changing direction, always “check your six” first. Try avoiding sudden turns, avoid making them too sharp or abrupt. 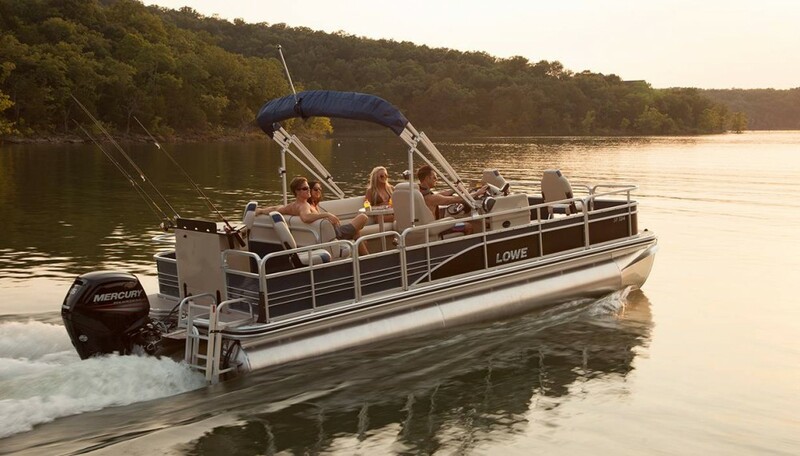 Handling pontoon boats like this Lowe SF234, a breed apart from the average powerboat. Let’s begin where the boating experience begins: taking the pontoon boat off the dock. This task isn’t much different from pulling any other boat out of the slip, and pontoons handle surprisingly well at slow speeds. But your usual enemy—the wind—has a lot more to grab on to, thanks to those vertical fences surrounding the deck. And at the same time, the “logs” (as each individual pontoon is sometimes called) don’t reach very far down into the water. As a result, gusts that might push other kinds of boats slightly askew can knock a pontoon boat completely off course—or back into the dock you're leaving. How can you prevent this problem? Simply being aware of it is the most important thing, so you’ll be ready to counter that breeze with controlled blasts of power from the engine. And remember, "controlled" is the key word, here. Don't shift into gear then start turning the wheel, or you'll already be headed in the wrong direction. Point the drive first, and then shift. Use a short applications of power, re-direct the drive, then use another. Repeat as necessary. If you get into a fix, try operating in reverse instead of forward. Which way you turn the wheel may be a bit confusing at first, but going backwards places the boat's pivot point (the outdrive) as far up-wind as possible, minimizing the effects of the gusts. With the bow into the wind and your pivot point all the way aft, one good gust can send you reeling. Now that you're out in open water, you're probably ready to pick up some speed. As you would with most outboard-powered boats, you’ll want to make sure the engine is trimmed down to mitigate bowrise. Apply power smoothly and slowly (and warn your guests about your next move, so you don’t catch them by surprise. Watch for the bow to level out as the boat breaks onto plane. Once it does so, you can trim the engine up to both boost speed and attain a more comfortable and/or efficient running attitude. If you hear a howling sound from the propeller, your speed drops, or you feel the boat get “squirrelly” (the bow seems to lift out of the water, wants to wander instead of staying straight, and requires constant course correction), that means you’ve trimmed up too far and need to bring the engine back down until the boat stabilizes again. Just how fast should you be going? Boats don’t have brakes, so always put caution before fun. On crowded waterways, more traffic equals less speed. Even when the lake is not crowded, you still need to follow the engine manufacturer’s recommendations for cruising RPM. In most cases, this will be about 75 percent of wide open throttle. So an average outboard with a maximum recommended wide open RPM of 6000 should usually be cruised in the neighborhood of 4500 RPM. If fuel efficiency is your goal, you’ll want to back that throttle down a bit. Most efficient cruise usually comes shortly after the boat begins planning, in the 3000 to 3500 RPM range. 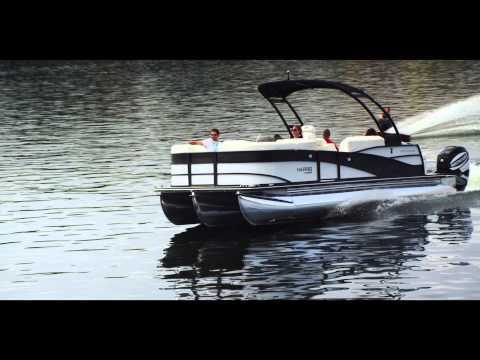 A great example of how RPM, speed, and fuel burn relate to efficiency can be seen in our Princecraft Vectra 23 Pontoon Boat Video Boat Review. Look for the full performance data chart, which pops up on the screen about 35 seconds in. At 3000 RPM the boat breaks a plane and does 17.0 MPH, while it burns a mere 2.1 gallons per hour. That nets 8.3 miles to the gallon—more than the boat gets just prior to planing, and significantly more than it gets at faster speeds. Now that you’re zooming across the water, you may want to change direction—either just for fun, or to follow the shoreline. Always “check your six” first. There are no lanes on the water, and you never know when another boat will be overtaking from astern, will change its course without warning, or will even turn into your path. Tri-toon pontoon boats (those with triple logs) can offer handling and performance that's similar to that of a V-hull. Every boat is different, but as a general rule of thumb pontoon boats tend to stay flat or bank out, unlike the inward bank of a V-hull. 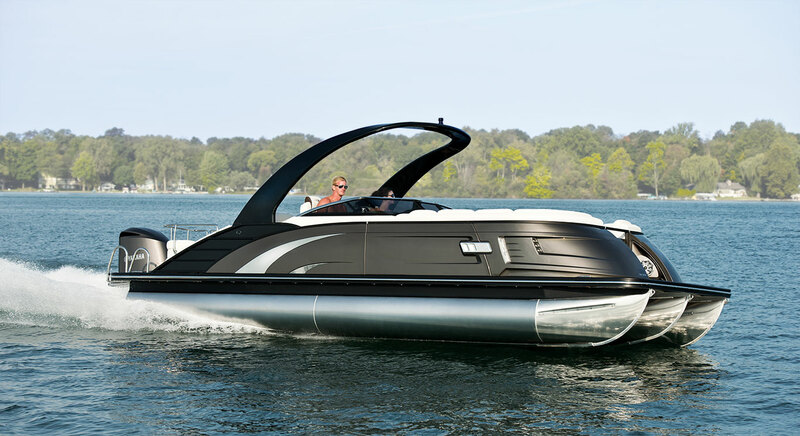 (The exception is high-performance tri-toons, which are sometimes designed with the center pontoon lower, causing the boat to bank inward.) Remember that sudden turns can send coolers, gear, or even people sliding across the deck, so try to avoid making them too sharp or abrupt. And again, warn your passengers about any intended course change that might throw them off balance. If you make a relatively sharp turn and suddenly hear that propeller howling, or notice a dramatic loss of speed, you’ve just experienced “blowing out” the propeller. It’s gasping air instead of grabbing water, and this situation is resolved by either trimming the engine down a bit or backing off on the turn. What about flipping or rolling the boat? Is this a danger when you go into a turn? Probably not. 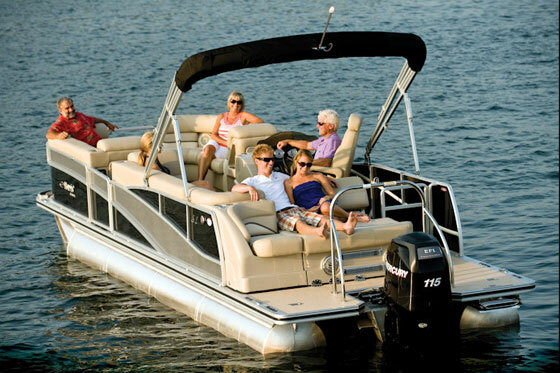 Most modern pontoon boats are amazingly stable and properly powered, and the chances of flipping one over are remote at best. But any boat does inherently become less stable when turning, and depending on sea conditions, speed, and weight distribution, the possibility can’t be ruled out—particularly with fast, high-powered performance pontoon boats. So if you ever go the least bit beyond your comfort level, simply reduce your speed and the tightness of the turn. 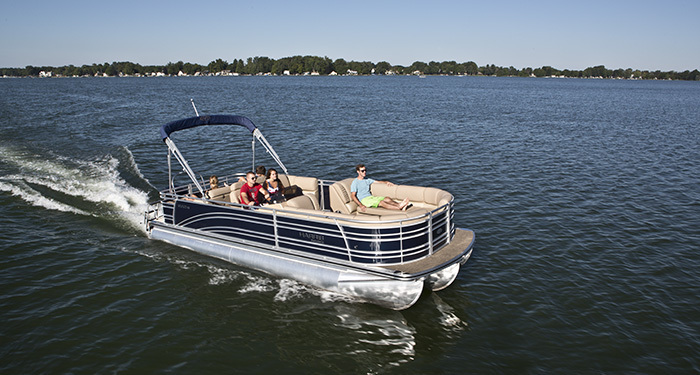 The rules for beaching or swimming from your pontoon boat are no different than they are for other types of boats. Always travel very slowly as you enter the shallows, and as slowly as possible if you think there’s any chance of running aground before you reach the beach. Never allow anyone to swim around the boat when the motor is running, and never jump or dive from the boat if you can’t see through the water clearly and/or haven’t verified the depth. If you set the anchor, always secure the anchor line to the bow of the boat. And when rafting up with a friend, make sure you use several fenders to prevent the boats from banging into each other and causing damage. Tip: Whenever you enter shallow waters, trim the engine up to reduce draft—but don't go all the way up. If you tilt it as far up as you can and then run aground, you’re stuck. Instead, trim it up until the prop begins gasping air, then drop it back down at least two inches. If you do run aground, you can tilt the motor up an inch or two and hopefully be able to back off. Ready to head back to the marina? For docking maneuvers, again you’ll want to handle a pontoon boat just as you would a V-hull, while being extra wary of wind effect. To get some pointers on the basics of side-to boat docking, watch our How to Dock a Powerboat video. And remember: don’t shut down the powerplant as soon as your boat enters the slip. If you leave the engine idling until all the lines are in place, you’ll be able to realign the boat if it gets blown off kilter. While we hate to think of the boating day being over, it's important to get that pontoon boat safely back into its dock. 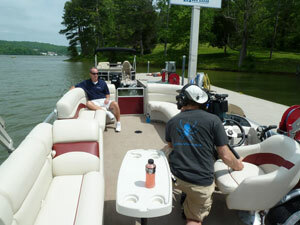 Now, do you feel ready to hit the lake on your new pontoon boat? Great! And the next time you're stuck inside on a cold, rainy day, don't forget to check out the boats.com How To section. 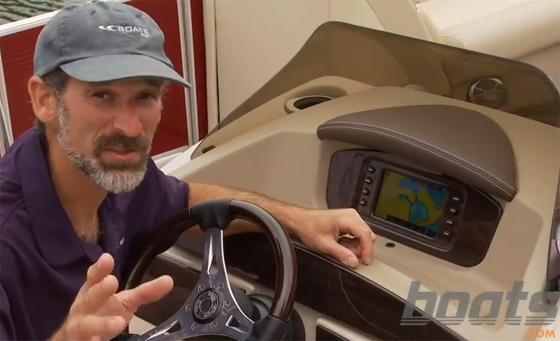 We've got lots more tips, tricks, and tactics that will help you become a better boater. Editor's Note: This story was originally published on boats.com in October 2014 and republished in June 2016 for National Fishing and Boating Week (NFBW).